YOUTH, Sports, Arts and Recreation Minister Kirsty Coventry has dismissed as false reports that she resigned from her ministerial position. False reports circulated on social media early this week that she stepped down because of the violence that rocked the country this week. In a Twitter message, Minister Coventry said she had no intentions to quit. “I would like to make it clear that I have not resigned as minister. Whatever the problems, sport can and should be part of the solution and I will pour my energies into uplifting our youth, sports and arts until I can no longer be effective and make the impact we need in our country,” she said. 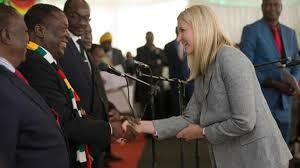 The Minister urged Zimbabweans to desist from violence. “Violence is never the answer and it needs to be investigated and actions taken. We need peace so no one else suffers and we can rebuild our nation together,” she said. Minister Coventry said the violence was a sad development. “What has happened in Zimbabwe had saddened me immensely. I am sorry to everyone that has been affected by the recent events,” she said. MDC Alliance instigated violence resulted in three deaths and destruction of property worth thousands of dollars.